We love our city, so we try to take on projects that show off our local community as often as we can. This spring the Downtown Council came to us to help modernize the Aquatennial, a historic celebration that has meant many different things at many different times. Today, the festival will be all about bringing people into downtown Minneapolis to celebrate our city's vibrant arts, music, athletic and food communities. We were excited for the chance to help. Many of us have fond memories of attending the Aquatennial as we grew up, watching the fireworks or cheering on the boat races. Plus, working on this project meant our designers got to do some awesome, outside-the-box creative work. For the greater identity, we created a set of icons that mimicked the forms found in the mark. 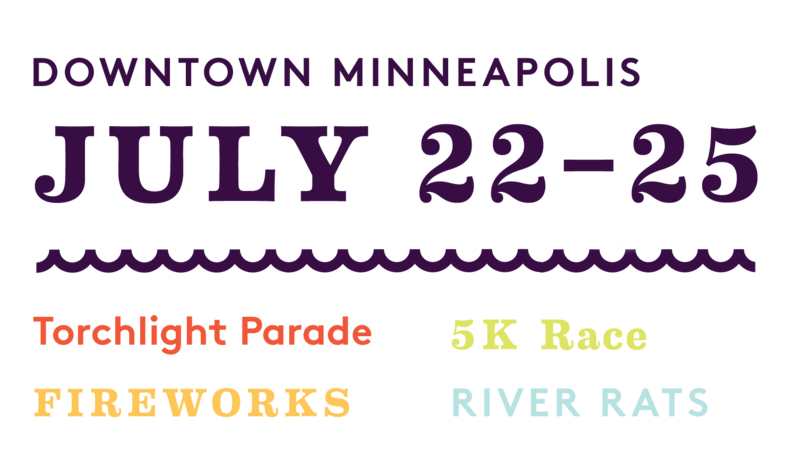 We also designed a series simple, colorful, and bold illustrations that captured the feeling of summer in Minneapolis with water, fireworks, food, music, and local architectural elements. The illustration needed to adapt to different applications, so we designed everything based off an underlying grid. That way the elements can be chopped up, restructured, and will still fit together like puzzle pieces. For typography, we chose Brown from Lineto and Eames Century Modern from House Industries. Both have a ton of personality and quirkiness to them so they fit well with the rest of the identity and complement each other well. Using both a serif and a sans-serif helps the identity stay lively and flexible. We had a blast creating this identity system and can’t wait to see it come to life this summer. We’ll see you downtown!